When it comes to streaming unlimited music, Spotify is one of the best services providing high quality music with a catalogue of over 20 million. But if you are a Spotify Free user, you may have already fallen inside the cap. First, you get only 10 hours of streaming per month, and second, you are limited to a maximum of 5 unique plays per song (unless of course, you are in the US). Only Spotify Premium subscription allows you to carry your music with you. Today we’ll show you how to download songs from Spotify for free. Spotify’s desktop application is quite like a closed ecosystem. You can’t access the interface until you log in, and even if it downloads songs locally for playback, it is stored in an encrypted format which only the player can decrypt. So normally, you won’t be able to access Spotify songs from the local cache. However, there are some workarounds to save your Spotify music locally. One way to save your Spotify music on computer is to record the audio as it is being played on Spotify. Though there are quite a good number of sound recorders out there, only a few are capable of recording at the hardware level. Hardware recording ensures near lossless audio from recording source. Replay Music is one such sound recorder application for Windows that lets you record high quality MP3s from online streaming services like Spotify (which means that other services like Rdio, MOG, Pandora are also supported). 4 Is it legal to record music from Spotify? Download and install Replay Music (Free Trial or Purchase Full Version). After installation, open up Settings >> Input tab and set the input source to Audio Driver. You can also use the Rec. Playback option according to your need. Audio driver: This input source option directly grabs the audio from your computer’s sound driver and automatically binds to the specific player being used. Once bound to the audio player, Replay Music will only record from that particular source / player. The sound output doesn’t matter in this case; which means, you can even mute the particular player and do other sound related activities without worrying about recording interruptions. Rec. Playback: Sometimes, Replay Music might not be able to capture the audio source when, for example, you play something on your web browser. In that case, Rec. Playback comes in handy. This option uses the audio output source for recording. And since there is no binding to any specific application, Replay Music records sounds from all applications. Also, if volume is muted, it won’t record anything. Thus, you should be careful not to perform any other sound related activities during recording. Go to Settings >> Output tab and select your preferred recording format, bitrate , volume and also toggle automatic tagging. For best quality recording, save your songs in MP3 format at 320 kbps. Open Replay Music and Spotify. Play a song on Spotify to check if Replay Music has detected the player. If it detects Spotify, the blue bar on the top right will change levels according to the beat. If not, close both the applications; launch Replay Music first and then Spotify. Click on the Start Recording button on Replay Music and play the song you want to download. Replay music will record the song and save it as MP3 to your local folder. The resultant recording will be a near replica of the original song. Even after clicking on the Start Recording option, Replay Music will wait for the song to begin playing on Spotify. So your recording does not have any blank portions. After the track finishes playing, it will automatically switch to a different file to record the next song. So you don’t have to stop recording after every song. If connected to Internet, track information like Artist, Album, Genre and other metadata will be filled automatically. After recording all your songs, just hit the Stop Recording button and save the recordings in one of your media library folders and the tracks will automatically be picked up by your music player. Replay Music works for both desktop and web versions of Spotify. There have been several browser add-ons to try and capture the Spotify’s HTTP stream. 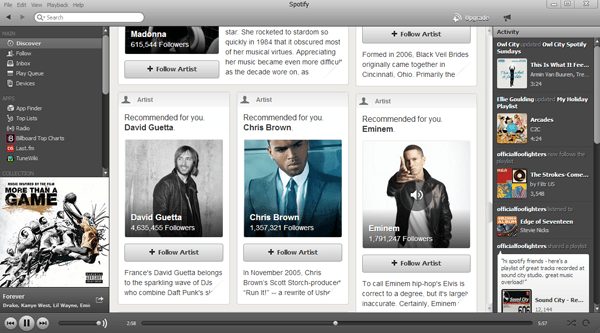 One such popular extension was Downloadify which could download songs from Spotify Web. But their glory lasted for only a few days. Shortly after they put up the extension on Chrome Web Store, Downloadify was pulled down and removed. But the extension remained on Github and continued to do its work. Finally, it was Spotify who came forward and stop the illegal downloads. They encrypted their HTTP stream and used the web player to perform live decryption during playback. This means that you may be able to download Spotify songs but your media player will not be able to play it properly. However, you can also record songs from Spotify Web and save it locally to your computer. You have to use the Rec. Playback input source to record from your web browser using Replay Music. Recording with Replay Music gives you near lossless information, since it records at the hardware level, but the free version only lets you save and tag up to 25 tracks. If you find the software useful, you can buy the full version and remove the limitation. Is it legal to record music from Spotify? According to Replay Music, you are allowed to record media streaming content as long as you do it for personal use. Recording streaming content has been compared to ripping music from original CDs. Whether it’s legal or not, the answer is still a bit foggy. If you like a song or an album, you should support the artist by buying their content. 7labs is not responsible for any misuse of this process/software. Unfortunately, Spotify and its amazing service is not available for everyone. Spotify supports, as of now, 23 countries. If you reside somewhere outside these countries, Spotify is not yet available for you. But you can access and use Spotify using a suitable proxy or VPN service.